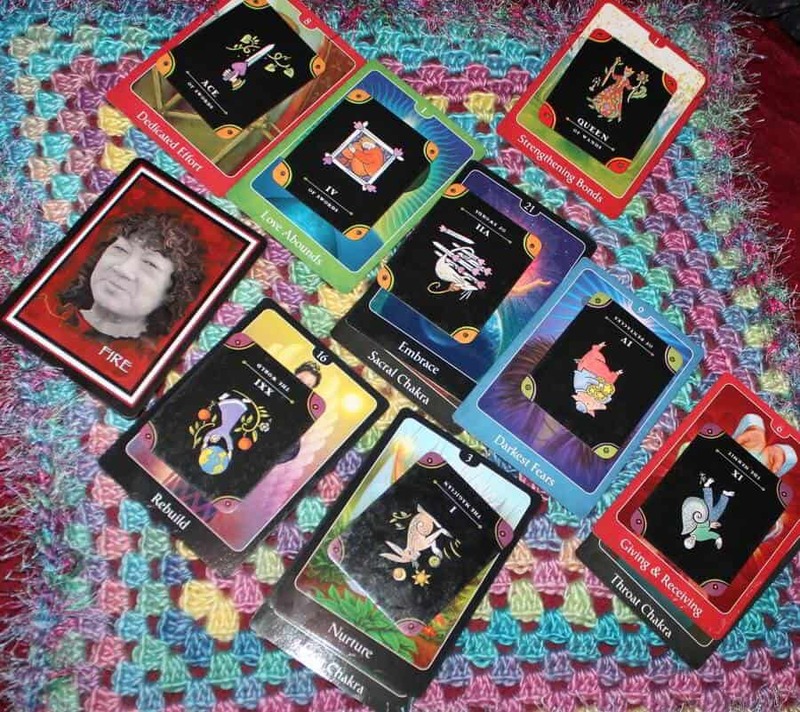 The Three of Cups in the form of “Rejoice in Celebration” shows up with “what to take from the past.” Before I pulled the card, however, the sacral charka card (associated with pleasure and emotion) came up to drive the point home/dixiblog/domains/afoolsjourney.com/public_html. Focus on the good stuff from the past! But more importantly, look for ways you can carry it with you moving forward. That doesn’t mean you need to have the same old crew seated around the celebratory dinner table. Far from it. It means you pay attention to the activities, the thoughts, the feelings, the essence of what you have valued in the past and invoke that in the present to fire up joy and creativity. Find a way to not only bring that joy back to life, but make it your own in the process! This is like finding a new band in the same musical genre. Look for the essence of joy you’ve had previously and understand it truly does belong to you, even if the community with which you enjoyed it is not currently available. Take what works, what comforts and inspires you, and own it! Don’t try to reanimated a zombie, just resurrect the joy. Do you have some joy to resurrect? I recently told a client to budget some energy for herself. Much like the financial advice of “pay yourself first,” here the joy-making needs to be prioritized and protected. Pleasure isn’t the only benefit of a free-flowing second charka. Creativity, contentment and satisfaction add into the mix. Set aside some special time, spend an hour doing something “just for the joy of it,” and don’t neglect your sensual self. Indulgent baths, fine chocolate (if your nutritional plan fits), comfortable clothing, arts and crafts time, a cup of hot tea and a good book, some classical music, sewing, cooking, painting, or even a romp with your partner would all fit into sanctioned Sacral Charka activities. You have my blessing to be good to yourself! It helps you to get your wishes. It’s the time to do exactly as you wish. Make room for it! Are you ready for a “Sacral Chakra” break? Follow Dixie and the Everyday Tarot on Twitter or YouTube. Or just schedule a Tarot session.